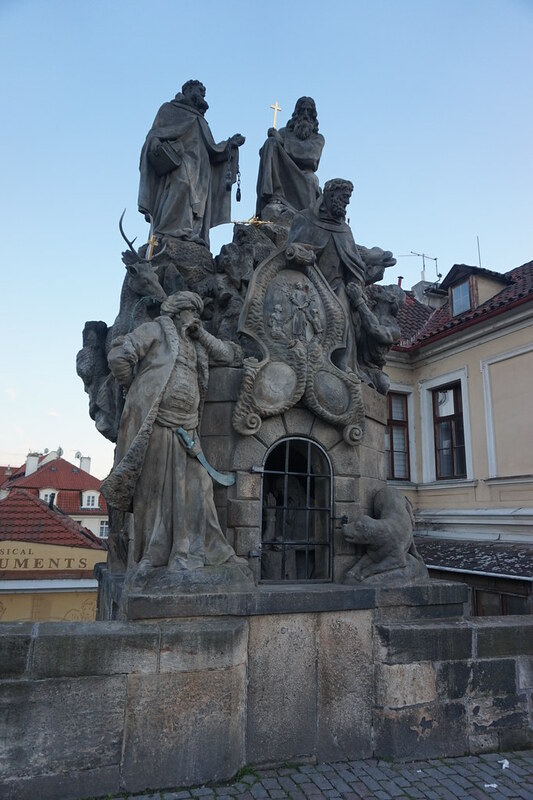 I do not propose to describe the Charles Bridge to you, as I am supplying an illustration showing it, but I wish to remark here that Charles is not guilty of the groups of statuary which distinguish this bridge from others in the world. 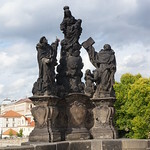 The only bit of statuary anywhere near the Charles Bridge which dates from his period stands near the Mala Strana end of it on the upstream side. This is the sculptured figure of a knight in armour, bearing the coat of arms of the Old Town and holding aloft his drawn sword. Dr. Jerabek calls this figure "Bruncvik," others call it "Roland"; it was probably put up to inform passers-by that they had better pay their toll quietly or there would be trouble. The piles of the Charles Bridge nearest to the left bank of the river stand on a little island called Kampa. You cannot see much of this island from the bridge: I recommend you to go down the steps, under the bridge, and then look under the second arch, and you will see the view which I have sketched for you. It is not the view which you will find on the postcards illustrating this particular spot and calling it "Venice on the Vltava." In this the Pragers fall into the snobbish habit of going outside their own country for the sake of finding some inept comparison. So Charles threw this bridge across the water, a lasting, glorious monument to a father ever careful of his children's welfare, and its stout pillars and graceful arches bid fair to call up reflections for yet further centuries on the face of Bohemia's own river, the Vltava. The river at Prague is worthy of careful study, but whatever I may suggest as to its influence on the people of Prague, I still advise you to come here and judge for yourself. Remember, its name is "Vltava," out of which the Germans had made "Moldau," by which you have probably known it till now; but the map of Europe has been readjusted lately, names have changed back to their original version, and so the river at Prague has resumed definitely its Slavonic designation, which, though not given on any map, yet lived in the memory of the people. There lingers a strong, a powerfully attractive allure of old Prague, just about this quarter, at the left bank end of the Charles Bridge. There is a quaint old tower that dates from Queen Judith's time. I have already pointed it out to you, and told you that it was until fairly recently used as a lock-up. The battlement across the gateway used to bear indications of rough justice as executed in those days; it was frequently adorned with the heads of rebels, traitors or others who had become unpopular, as, for instance, one Bohemicky. The tower on the right bank end of the Charles Bridge bears every indication of dating from King Wenceslaus IV, as his device, the kingfisher, is found to figure in its decorative scheme. 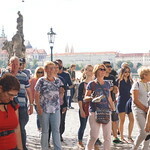 Between these two bridgeheads passes a good deal of the historic pageant of Old Prague. Each pillar of the bridge that Charles built is crowned by the effigy of a saint or groups of saints, with most of whom, I regret to say, I am not acquainted. 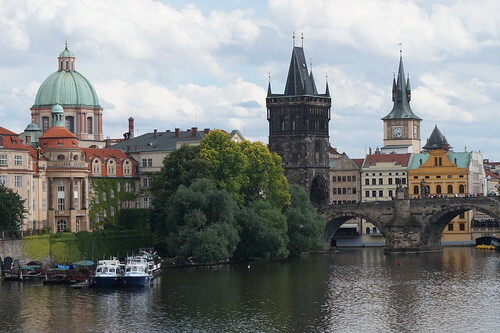 There are, however, some old friends—Saints Ludmilla, Wenceslaus, Cosmas and Damain, and Adalbert—who are intimately connected with the story of Prague.